This machine is no longer in production. We would recommend the Billcon N120A as its replacement. The EV 8626 features the most efficient feed system. The feed system is the heart of any banknote counter and the EV 8626 incorporates the unique UltraFeed™ system which maximizes the feed efficiency of the counter, ensuring that it consistently feeds all banknotes irrespective of design and quality of condition. 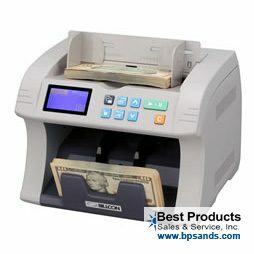 Designed for mid volume applications, the Talaris 8626 Money Counter is affordability and reliability at its best. If the feed is consistent, count accuracy and banknote authentication are enhanced. “Right first time, every time” accuracy In field tests, the Talaris unique Mechanical Double Detection (MDD) technology is up to 100 times more accurate than alternative systems, such as opacity. The MDD technology system accurately counts all banknotes even with different densities of paper, excessive levels of dirt or staining and clear windows commonly found in polymer notes. Speed and throughput With a top speed of 1,500 notes per minute (NPM) the EV8626 offers speed and throughput levels to count notes and authentication processing. High throughput speed is the ability to maintain a high work rate all day long, boosting productivity and profitability. Robust build and a premium look and feel From the metal side plates and sheet metal running through the heart of the machine, to the ergonomic handle and user-friendly keypad, the EV8626 is a robust and reliable note counter. The Talaris EV8626 is a robust currency banknote counter and is the entry level model from Talaris; EV86-Series of banknote counters. 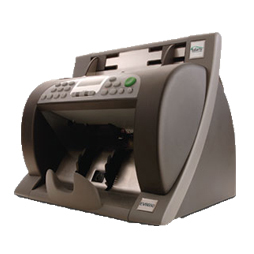 It is ideal for users who require a reliable and highly accurate solution for processing low to medium volumes of banknotes.